I was awakened in the middle of the night by the thunder of a huge avalanche. These are common on Everest, happening every night, but this one sounded bigger than usual. Although it was bitterly cold, and I was still half asleep, I decided to open the rear tent flap and take a look. To my left, on the steep slopes of the west shoulder, was a shocking sight: An avalanche boiling and churning its way down to the cwm, lit by the moon and starlight… alive with lightning. Bolts of blue electricity arced and danced inside it, just like static electricity I once saw as a child in fleece pajamas under the covers on a cold, dry, winter night… but here on a massive scale. It occurred to me that avalanches must always be full of static discharge, which is hidden in the sunlight of day. Now, in the darkness, it was visible: eerie, powerful, and raw. And I thought, I hope the Norwegians are OK, because I knew their camp was in that direction. Fortunately, this one fizzled as soon as it hit the bottom. While the roar subsided, and the cloud of spindrift settled into the night, I was left looking at the austerity of the cwm. Lhotse watched from above in the distance, appearing undeniably like a crumbling, ancient castle tower. On my right, the savagely austere wall of Nuptse, its flutings of snow holding on to the seemingly vertical rock. And straight ahead, wave after wave of snow-covered glacier, rising majestically up the cwm. 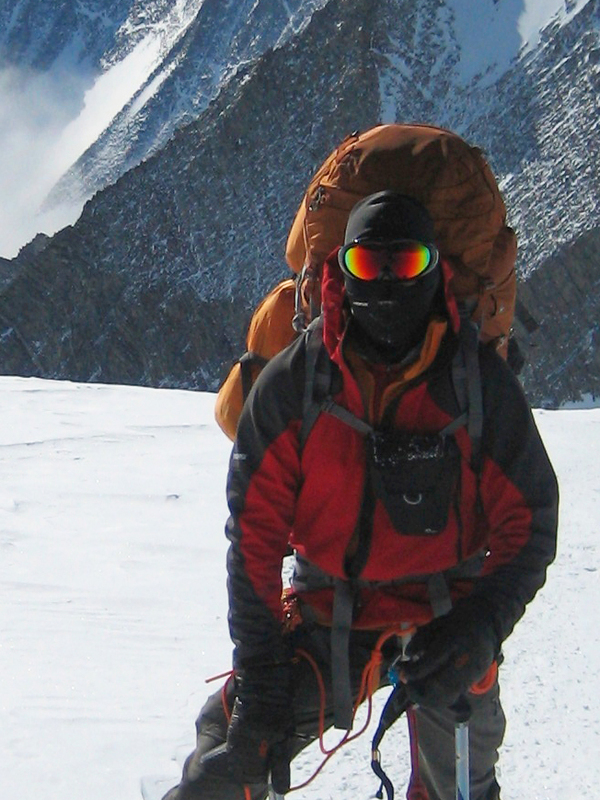 Climbing Everest is a busy process, with few times of genuine quiet and solitude. This was a rare moment, and I savored it. For at least 30 seconds. Until the intense cold drove me back into the tent and the protection of my sleeping bag. The wake-up and breakfast routines were nothing unusual. We got moving around 8:30 AM, as I recall. The goal: Camp 2, sitting about 1,700 vertical feet above, and perhaps 1.25 horizontal miles away. A thick cloud layer shrouded the cwm, but snow conditions were fine, and we made good progress on the same route we had taken the day before to Nuptse Corner, the big dogleg to the right of the route that allows us to avoid the largest crevasses that run across the middle of the cwm. Scaling the snow slab faces was a bit easier than the day before, but it was still tough. A few times I had to pause to catch my breath, which was very frustrating. This should be easier. The next time we come here, C1 will be just a waypoint for lunch. This whole route will be done in one day. The thought was demoralizing, and I wanted to be in better shape already. Of course, this is exactly what the acclimatization process is about, and we were actually in fine form. But, such insights are elusive while huffing and puffing on the glacier. Short break at the big crevasse where we had turned the prior day, and we were off. I took no photos whatsoever, because the light was flat and the clouds hid the surrounding peaks from view. Besides, I had shot some nice pictures the day before. Blake snapped one photo as we rounded Nuptse corner and approached the break spot… as far as I know, it is the only photo taken by our team that day. Above the break spot, the route moderated considerably. Several crevasses required short horizontal ladder crossings, but no big deal. This section of the route had occupied my thoughts for over a year. Every day I had envisioned it, imagined it, prepared for it. I could see that route as clearly as if it were in a photograph, with the towering figure of Lhotse above like a great unblinking eye in the sky, and the impossibly steep walls on either side, all lit by dazzling sunshine in a blue sky. I had a careful sun-avoidance strategy, because in direct sun the cwm becomes a solar oven, burning any exposed skin in minutes. In my imagination, this would be a trial of sun, sweat, and searing heat. I had even chosen a soundtrack for this section (Black – Trifonic Mix by The M Machine). In reality, we were blessed with thick clouds that shielded us from the sun… and also blocked the view. The higher we went, the thicker the clouds became, and there was no way to see our destination. It’s just over the next rise…. it must be over the next one. Looking for the destination is a story as old as time in mountaineering, and it’s bad news. Anyone with experience knows the drill: Choose an objective within sight, make it, and then choose the next one. Eventually, the day’s goal will come. In the flat light on the glacier, the only features that stood out were the wands marking the route, small dark sticks rising knee-high periodically from the snow. One by one, we passed them. And gradually we went up. The climb towards C2 felt like a glacier trudge anywhere else in the mountains, not a spiritual journey. And that was fine… Let’s just get there. After about 45 minutes, C2 came into view in the fog. Sitting on the north side of the cwm’s lateral moraine, C2 is reminiscent of EBC: tents clustered in a long, chaotic line. The moraine climbs a bit steeply up towards the top of the cwm, and IMG happens to be at the crest of C2… the most auspicious spot available, commanding an incredible view on clear days (a view obscured from us at the time). It is also as safe is it gets up there, relatively protected from avalanche risk due to a small valley at the bottom of the west ridge. But, being high in camp meant that we had to make our way up past virtually everyone else, on a track that littered with scattered rocks and was broken in several spots by deep crevasses. Again, impossible to find my rhythm there, some steps big and others small, sometimes waiting at choke points and at other times rushing to catch up. Pulling into C2 a couple hours after leaving C1 was a huge relief. C2 was much more substantial than C1 . It was a proper advanced base camp (indeed, many refer to C2 as ABC). The same large wall tents we had at EBC were here: one for cooking, one for communications, one for storage, and one for dining. We dropped our gear at the dining tent, sat at the table, and drank warm tea. It felt familiar, yet more spartan than EBC, without the touches that lent cheer to our usual dining tent. Every ounce is precious up there, so no room for anything unessential. IMG runs the tightest ship on the mountain, without unnecessary frills up high—exactly the way it should be. This is home for now. Right on. The cold was not overwhelming, but there was a distinct dampness there that seemed to permeate every pore, worsened by being in sweaty layers, making me very uncomfortable. First things first, get those layers off and settle in. Our sleeping tents clustered just downhill, the same Eureka model we knew and loved. Because we were the first IMG climbers to reach C2, many tents still had not been pitched, but there was an unoccupied extra tent erected next the one Blake and I had chosen, and I decided to see whether I could sleep there on my own. (Blake is the best tent mate one could want, but a single tent up high is just easier to occupy and organize, although it is also colder at night.) But, as soon as I unzipped the tent flap, I was hit with an overwhelming stench of mildew. My god, this thing has been wet for a whole year up here. This tent must have been left in the evacuation of Everest the year before, following the icefall tragedy. Leaving gear at C2 was a groundbreaking decision, the first time SPCC had allowed durable goods to remain in place, and a move long overdue in most people’s mind, including mine. 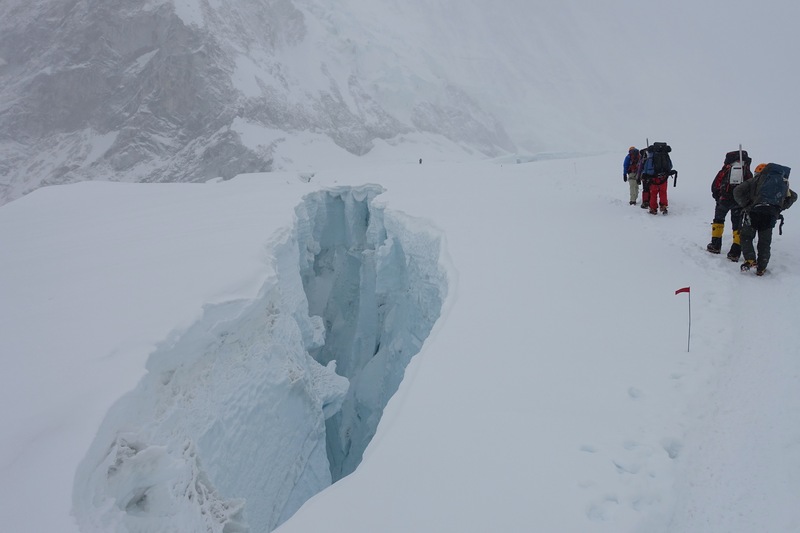 (More goods at C2 means fewer crossings of the icefall, which means lower risk for the Sherpa.) In the case of this one little tent, a problem: Mad levels of mildew, rendering it uninhabitalbe. I would have predicted that the cold, dry atmosphere up there would have prevented or reduced the growth of any microbes. Wrong again! The microbial world never fails to amaze me. But, no worries. Shortly after 11 AM Blake and I moved into a good tent together, got our stuff roughly unpacked, and settled in for a planned two nights at C2. As usual when arriving at a new camp, we took a nap, and planned to get up for lunch at 12:30. I enjoyed getting comfortable in dry layers and warming up in the sleeping bag. And I fell asleep quickly. I was awakened by a strong wind, which grew louder and louder, shaking the tent. We get lots of wind on Everest, and so I just ignored it and tried to doze back to sleep. But, it grew louder and stronger. Blake sat up, and we looked at each other. “Pretty strong wind,” I said. “That’s not wind, it’s an avalanche,” replied Blake. I realized that it was not only the tent shaking, but the ground as well, rolling me from side to side. Must be a monster, coming down from the West Ridge. Or maybe from Nuptse. I sat up, too, and tried to fully wake up. We opened the front tent flap to see where the avalanche was coming from, but the clouds were too thick and we could barely see across the small valley to the base of the West Ridge. Suddenly our guide Andy came into view, hustling quickly past. “Get your boots on!” he hollered, and kept heading up towards camp. Crikey, this thing may reach us. I’m not sure whether it was because I was still half asleep, or whether it was because we had seen so many of these so many times before, but I felt no panic or fear. The thought of being buried never came fully into focus. This is Camp 2, we are on top of a ridge. We’re perfectly fine here. We grabbed our boots from the vestibule and zipped the flap shut to prevent spindrift from filling the tent. And we waited. Sure enough, moments later we could hear and feel the spindrift hit the tent in a light gust of icy wind, but nothing dramatic, and none of it penetrated the seams. Then, quiet. No big deal. I thought about going back to sleep for a minute, that’s how tired I was, but it occurred to me that I should make sure everyone was OK. I looked out the rear vestibule and saw a team member jogging by. Yep, better check things out. I put my boots on sloppily, unlaced, and clomped out into the snow. Everything was slightly dusted, and the light was still flat in thick cloud cover. I headed quickly to the dining tent, where the team assembled. “Where did it come from?” “That was a huge one.” “Are you OK?” It certainly seemed like everything was fine. Moments later, commotion. A team of our Sherpas brought in one of our high altitude porters, writhing in pain. He was a young man in great distress, hyperventilating, and moaning, and I thought right away of chest or head trauma. We helped settle him in, got an insulated pad underneath him, and I started the primary survey and history, with the help of our senior Sherpa guides as interpreters. When the avalanche had started, he had turned to seek shelter down valley, and while running through the thick snowfall had accidentally crashed into a granite boulder hidden in the snow, smashing his knee and leg into it at full speed. First aid training came back from my wilderness EMT days (thank you FOP! ), and we got him stabilized, settled down, and more comfortable. Within half an hour beside him, I was confident that he was going to be fine in the long run, and that a proximal tibia fracture was unlikely; however, it was clear that he really was suffering terribly, and that walking out under his own power would be very challenging. He would likely need a helivac to get down the icefall, although not today—good thing, given the very dense cloud cover and snowfall, making any flights up high impossible. We moved him into a different large tent which was quieter, ensured he was well insulated and hydrated and medicated and that his leg was elevated and immobilized, and things calmed down. The Sherpa assured me that they would keep an eye on him, and I left for the main tent to see who else needed help. I asked whether anyone had figured out where the avalanche came from, and they looked at me blankly. “It was an earthquake,” Andy said. “Yes. They felt it at basecamp too.” Everyone nodded at me, as if it were the most obvious thing in the world. “Andy, this wasn’t in the brochure.” An earthquake. Nothing could have seemed more bizarre. What’s next? Dolphins descending from the sky with laser guns in their melons? Seriously. An effing earthquake! Can this place get any more strange and hostile? I pictured a map of the world, with the Indian subcontinent crashing into Asia: This long, slow collision was the reason the Himalayas existed, after all. Why had this not occurred to me before? The famous saying thrummed in my mind: Geologic time includes NOW. Everest garners lots of media attention, and I thought this little shake might make it onto someone’s blog or maybe even a news report—not likely, given how mild it was, but maybe. I did not want my family to worry needlessly. I checked my watch: 12:35 PM. It’s late in Seattle, but I should let Julie know I’m OK. No cell reception at C2, but one of my teammates had a satellite phone. He had just chatted with his family, and I asked whether I could make a one-minute call to mine. He did not hesitate, and I made the call. Julie was surprised to hear from me at midnight, but I explained that there had been a small earthquake, and that she might hear about it on the news; not likely she would, but just in case: we were all fine at C2, and all IMG climbers were fine per radio reports from below, so nothing to worry about. I told her I loved her, and we said goodbye. She sounded sleepy, of course, and while we spoke I could feel, taste, smell, touch home. Home. So warm and comfortable and secure. I missed her and the kids terribly. But, all systems were go, we were fine, and I ended the call glad that she knew we were well. On my first check 20 minutes later, my patient with the leg injury had developed paresthesias (pins and needles sensation) of the leg and the foot. Touching him elicited severe, shooting pains. As you might imagine, this is not good, because it may signify the development of “compartment syndrome,” in which swelling raises the pressure in one of the anatomic spaces of the limb, cutting off its blood supply. It is a limb-threatening emergeny, and not something I could treat up there. Manometry is the way to confirm the diagnosis, in which a needle is inserted into each anatomic space, connected to a pressure gauge… not a procedure I could imagine doing safely. I started to think of creative ways to deal with this aside form simple elevation… a fasciotomy at 21,300 feet would probably be a first. I must say, I felt quite alone for a time. There must be another explanation. His distal pulses were weak at best… But, the knee and tibia looked about the same on exam, not dramatically more swollen… Why the hell should he have compartment syndrome? Did I miss a bigger crush injury? In fact, the nerve distribution of his pain indicated a limb level rather than a specific nerve distribution, and I decided that his splint had been too tight. His leg was falling asleep! We loosened it, and gradually things settled. Back at the dining tent I began to pay attention to the radio chatter. Over the next few hours I was floored by what I heard. Thankfully, our teammates at C1 were just fine. Every last one. And no injuries were reported there by radio on any team that I can recall. But EBC sounded like a battle zone. Our section of camp was intact, but part of EBC uphill from us, in the central section, had been “hit” by the quake. Somehow. Call after call for assistance with major-multitrauma patients came over the radio. “Please bring a stretcher…. Wait… no… please make it a tarp instead.” Awful, terrible scenes played out in my mind. (And what I imagined was far less terrible than the truth turned out to be, as I would learn firsthand two days later.) I listened as the IMG team led the rescue effort. Many people from different expeditions worked together, selflessly, hour after hour after hour. But, based on what I heard on the radio, it was clear that IMG was at the tip of the spear. Greg Vernovage in particular did an absolutely remarkable job. You could not hope for more professional, clear, decisive leadership in any circumstances, civilian or military, from Greg and from the entire IMG team. I think everyone on the mountain that day recognized that leadership. I had no right to feel proud of anyone down there, but I did anyway. HRA, home to our beloved Himalayan Rescue Association physicians, had been destroyed. Thus, our camp was converted into a hospital serving the severely injured at EBC. Walking wounded were taken to Himex. And those who were uninjured were beginning to trek out of EBC. Within a couple hours, we had the terrible news that two were dead. Two climbers have died… Who were they? How did EBC get so brutalized? And how many may have been lost in the icefall? I assumed that the earth had shaken so badly that crevasses had opened up in the glacier and swallowed tents, or triggered boulder fall and mudslides. There was no way they had been hit by an avalanche, because EBC is so far from the western rampart, (Pumori, Lingtren, Khumbutse), and separated from it by a huge ridge hundreds of meters away. The idea of a sonic blast turning surface debris into a killing wind seemed preposterous, and although we speculated about it, I doubted that could be true. It would not be until I saw EBC for myself that the true story became clear. Up at C2, our camp became the de-facto center of operations, and leaders from other expeditions came to our dining tent to meet, like a counsel of war. We climbers were happy to vacate the premises; we knew they needed to get a game plan. Ultimately, what came from that was a decision to do the only thing we could: sit tight and wait. We had plenty of supplies up there, including oxygen for a team member from a different expedition who was suffering from AMS (I offered to see him but was told that everything was under good control). There was no reason to bolt for the lower camps, and we were concerned that the route down could have been damaged by the quake. For that day, the plan was to just sit tight. Speaking for myself, I can say that in all honesty I never for one moment thought the expedition was over then. My teammates expressed this concern, but I rejected it out of hand. We were fine. A bit tired, and minus one high-altitude porter who would be OK… we were fine. Our camps were fine. The route back to EBC would have to be vetted and likely revised in the icefall, but that is exactly what happens all the time in the icefall. The avalanche cycle had just happened in a big way, reducing our risk from above. The route would be fine. This might be a setback of a few days, but nothing more. That evening we may have gotten vague rumors that the quake had reached as far as Kathmandu; I cannot be sure, but I think we did get those rumors that night. But, certainly I had no sense at all of what had truly happened; there was no way for us to realize that the quake had actually come from Kathmandu, that the nation’s meager infrastructure had been crushed, that thousands were dead, or even that more than twenty had perished right at EBC, just beneath our feet. Looking back now, it seems mad that we knew none of that. Part of the joy of climbing is being cut off from news… and in this case, it meant that we were cut off from news that centered on us and our friends. How could the Sherpas know the fate of their villages, their homes, their families? They simply could not know. They must have felt anxious if not fully terrified. But, they never let it show. I have never met a more stoic, focused, tough group of people. To this day I ask myself how I would react if the roles were reversed. I dare say I would not have handled it nearly so well. Listening to the response below, I was terribly frustrated. I desperately wanted to go down to help. I thought of my friends who are physicians, and imagined their anguish while trying to save patients in desperate circumstances. But, there was no way to get down there. Take care of your team, and take care of yourself. I slept poorly that night, stalked by nightmares. By then, the casualty count had risen terribly. Six have died. I thought of them perishing in crevasse falls, swallowed by the glacier. The notion that it could have been me certainly came into mind, but this was more about mourning and heartbreak for them and their families. Thank goodness I had spoken with Julie. I wondered if the news of the quake would make it to the USA. Probably a minor story, and a few people might worry about me… Hopefully Julie will post something on Facebook, I bet she will. Fantastic piece of writing Paul. I felt like I was there with you. Tragedy all around. Hopefully 2016 will bring new hope and then success for many good friends. Thanks for sharing. I’m sure it was difficult. Thanks Van D, great to hear from you! Yes, next year will be successful, in every way, I am sure! Perfection per usual. The writing gift runs in the family. Thanks Ann, but don’t be fooled: I am a hack. Julie is the real deal! Wow, I mean WOW. That was some amazing writing. That must have been a challenge to write. It’s quite awesome to read. So glad you and your team are safe. Always sad when we hear of the loss. Such tragedy for these poor people two seasons in a row. Thanks so much Trina, I appreciate your support and interest! Wonderful writing, Paul! I only wish I could have gotten to EBC in the weeks before the quake. I still am grateful for your help in my decision to take a heli out of Lobuche Base Camp. Looking forward to the next episode! Thanks Nelson, great to hear from you! As I read your story, I felt like I was there with you. Your descriptions made it come to life. Thank you for sharing this. It expanded my knowledge on many different levels. I am grateful that you were safe. Thanks Marna! Glad you are liking this… makes it worthwhile to put it together! Paul, I just discovered your blog through the sharing of your sis-in-law, Emily … and am touched by your accounts of this tragedy. So many of us back here had no idea what it was like up there on that mountain. Thank you for what you do for your fellow souls in this world, as a healer … and for putting your memories of the experience into such vibrant words. I know Julie is considered the writer in your family, but you have a very special gift for expressing yourself through the written word, as well. God bless you … and be safe. You are so lovely Danelle, thank you! I appreciate your interest and kind words. More soon!